I love cakes. I love ice creams. Sometimes it's hard to choose between the two, so what better solution than to have an ice cream cake? Off we went to Bake and Churn in SM City North EDSA Annex and got two dome ice cream cakes: Mango Madness for me, Rocky Road for bf. Each cake was 8" in diameter and cost P530. The cakes were housed in a special box that was supposed to keep them from melting for up to 3 hours (even 4 hours, according to Bake & Churn's Facebook page). I clarified that with the girl manning Bake and Churn's stall, just in case there was a separate container that we needed to buy to maintain the cake's form as long as possible. From SM North, it took me 20-30mins to get home. I excitedly unboxed my cake. Aside from a slight imperfection of the icing design at the base of the cake, the cake was beautiful. The Mango Madness cake had a cake layer consisting of vanilla sponge cake and sans rival wafer, as well as a mango ice cream layer. It also had a mango jam and cashew filling and a mango cream frosting. Topping the cake were whipped cream, mango jam, and cashew. I was clumsy in slicing the cake but here's a picture just to give you an idea of the layers. As for the Rocky Road cake, bf said it tasted fine. It had a chocolate sponge cake layer, a rocky road ice cream layer, chocolate ganache filling, and chocolate cream frosting, with chocolate bars, nuts, marshmallows, and chocolate syrup serving as toppings. There was one big problem with the cake though. Bf had to transport it all the way to Bulacan. His travel time that night was around 2 hours, most of which was spent in an airconditioned vehicle. The cake should be doing fine, right? But it looked awful. The ice cream layer had melted and collapsed prematurely. So, will I buy again? Sure. Next time I'll try their other flavors. But I won't recommend the ice cream cakes to someone who will travel for more than an hour. Good thing you didn't encounter any problem getting a cake that day. B&C was awfully busy that time since they were swamped with orders. Nice to know your mom enjoyed the cake. 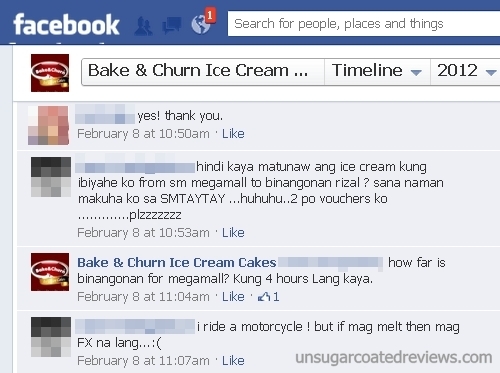 Hello, i made a review for the same two ice cream cakes :) your article is very nice too. Hi do they deliver po? ?